Luke McGee celebrates the Posh win at Northampton last season. Peterborough United have made an audacious attempt to re-sign highly-regarded goalkeeper Luke McGee. The club’s director of football Barry Fry has opened talks with Spurs chairman Daniel Levy over a free transfer move for a 21 year-old who made a huge impression on loan at the ABAX Stadium in the 2016-17 League One campaign. Mark Tyler will be concentrating on his coaching at Posh next season. It was McGee’s first taste of Football League action and he won the Posh players’ player-of-the-year prize after keeping 10 clean sheets in 45 appearances in all competitions. McGee is understood to be open to a move as his first-team chances at Premier League Spurs will be limited. “I went to the West Ham v Spurs match last Friday with the intention of speaking to Daniel Levy,” Fry said. “We had a conversation, and while negotiating with Levy is never easy, I made our case and I hope we will speak again soon. Young Posh goalkeeper Dion-Curtis Henry. “I want to sign Luke on a free transfer, but I would give Spurs a huge sell-on fee. “It makes sense for us and I think it makes sense for Spurs as well as, good as Luke is, he is not near their first team and I understand they will be signing another goalkeeper soon anyway. “We like Luke a lot. He’s the best goalkeeper alongside Mark Tyler in my time at the club and he will only improve. “He’s a million per cent interested in coming back to us next season. “He enjoyed his football, he got on well with the rest of the players and he enjoyed playing for Grant McCann. McGee’s wages would be a huge stumbling block for any deal. Posh chairman Darragh MacAnthony pushed the financial boat out to keep McGee on loan at the ABAX last season when his initial deal ended in January. 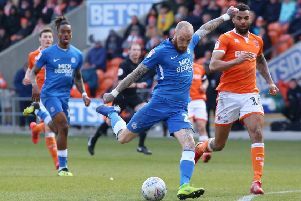 It was expected McGee would be sent out on loan to a Championship club next season to further his football education, but Posh are trying to thwart that possibility. When McGee left Posh at the end of last season, he posted an Instagram message to the club. It read: “I would like to thank the players, coaching staff, fans and everyone involved at Peterborough United for what’s been an amazing year for me. Posh have just one goalkeeper - teenager Dion-Curtis Henry - on their books after declining to give coach Tyler another playing contract. Henry is expected to move out on loan from the start of next season. Posh have been linked with young Birmingham City goalkeeper Jake Weaver and West Brom’s Jack Rose, both of whom are expected to be available for nothing in the summer. They both made appearances for Posh Reserves late last season. Fry added: “Dion wants first-team football which is perfectly understandable so we will probably let him go on loan.